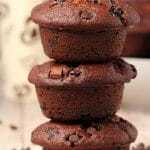 Double Chocolate Vegan Chocolate Muffins – Bakery Style! Double chocolate vegan chocolate muffins. These bakery-style muffins have a gorgeous domed top and are ultra moist and decadent. 1 cup (175g) Vegan Chocolate Chips and Chunks (Mixed)*, plus more to place on top. Preheat the oven to 350°F (180°C) and spray a muffin tray with non-stick spray. Set aside. Sift the flour and cocoa powder into a mixing bowl and add the brown sugar, baking soda, salt and instant coffee powder. Prepare the vegan buttermilk by adding 1 Tbsp lemon juice to a measuring jug and then adding soy milk up to the 1 cup (240ml) line. Allow it to curdle. Add to the mixing bowl. Add in the vanilla, melted coconut oil, applesauce and vinegar and stir into a thick batter. Add in the chocolate chips and chunks and fold in. Divide the batter evenly between the muffin partitions and then add a few more chocolate chips and chunks to the tops of the muffins. Bake for 25 minutes or until a toothpick inserted into the center of one of the muffins comes out clean (melted chocolate is fine but wet batter is not). Transfer to a wire cooling rack and allow to cool and then enjoy! *You can use either chocolate chips or chunks but I liked using a mix because as you can see from the photos, you have the different colors and textures of the two different types of chocolate. For chunks just chop up a bar of your favorite chocolate. If you are going to do half/half like I did, then use 88g chocolate chips and 88g chocolate chunks.